LONDON (Reuters) - Britain's double Olympics gold-medal winning gymnast Max Whitlock believes the sport's "confusing" scoring system could switch fans off and says new innovations should be considered. Nadia Comaneci's perfect 10 on the uneven bars at the 1976 Montreal Olympics is one of sport's iconic moments, but these days medals are decided by D-scores (difficulty) and E-scores (execution) that run to three decimal places. Recent dad Whitlock was taking a break from his usual routine this weekend at the Superstars of Gymnastics event at London's O2 Arena where, along with American superstar Simone Biles, he was thrilling crowds with an exhibition. Gymnasts, including Olympic horizontal bars champion Fabian Hambuchen, could use a "golden buzzer" option to maximize their scores on their favorite apparatus while they were free to experiment with new moves and routines. "I think it's very important that the sport can evolve," the 26-year-old Whitlock, who became Britain's first Olympic gold medalist in artistic gymnastics by winning floor and pommel in Rio, told Reuters. "Gymnastics is very confusing and no one really knows what a 15.355 really means. It's hard to keep up with. That takes away from the atmosphere and means the audience doesn't really get involved in the competition." 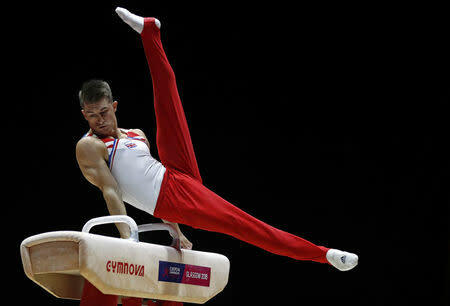 "Events like the Superstars of Gymnastics are so simple with the scoring out of 10," he said. "It would have been great to get a perfect 10 in my career. It would be hard to go back to that system now, but there are ways it could be simplified. "You look at football, swimming, athletics and it's so clear who the winner is and I think gymnastics needs that a bit more. "Everyone needs to brainstorm, get their heads together and think of ways we can simplify the sport and push it to the next level because I truly believe gymnastics has huge potential to grow." "Last two years I've been adding in new skills on floor and pommel because ever since Rio I said I didn't want to come back with the same routines," he said. "I'm constantly upping my start score. "I get a huge buzz from that. It keeps me on my toes and makes me work harder and motivated to stay at the level."